Meet your neighbor Nelisa Kelley. Nelisa was born in 1965 in Oklahoma. After high school she attended UNLV in Las Vegas and graduated in 1989 with a Bachelor of Science in Elementary Education. She taught for seven years in Las Vegas before moving to Texas, where she taught Kindergarten. She is now a teacher for the Head Start in Macomb. 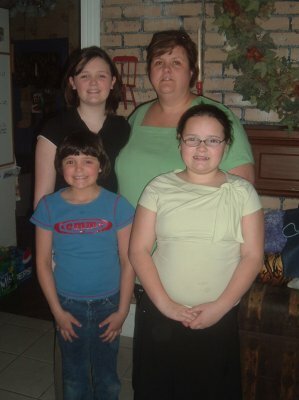 Nelisa has three daughters, Krysta (12), Kassidy (10), and Kinsey (8). Family brought them to La Harpe as Nelisa's only sibling, CJ Bolding moved here with her husband Louis. They had visited them several times and liked life in La Harpe and felt that there was no reason for them to be so far apart. So in June of 2005 they made the move to La Harpe from Paris, Texas. Krysta said she loves being close to her family, Kassidy likes the smaller town because she has move freedom, and Kinsey loves all the new friends she has made. Nelisa said that it is nice for the girls to be able to go outside and play and not have to worry about them. They are able to go to the park or for a walk, things that they couldn't do in Texas. They really do enjoy the small town life. Also making the trip with them from Texas was the girl's three dogs, a frog, and a guinea pig.